Every year, the Lord of Hell calls upon his henchmen to take part in fights in order to amuse him. Throughout the game, you'll take down enemy devils and destroy their fortresses. 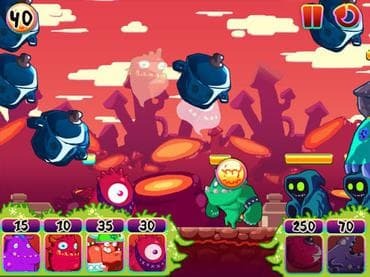 Fight against the wily little demons in 50 tactical levels of unabashed fun. Destroy their fortress, take their lunch money, and eat their ice-cream as you compete for supremacy. It's an all-out battle with pots, fireballs, crosses, and more. You will quickly learn however, that these demons are full of surprises so learning strategic nuances and upgrading your army is a must. Can you command your group well enough to be the victor in these entertaining challenges? Download this free game today and use your creativity in order to smack everything around. If you have questions about Funny Hell game, please contact us using this form.